"Today, as always in the past, the Klans’ grab-bag ideology of hatreds and grievances contains the seeds of its own destruction. Publicity has the power to show “Klansmen” for what they really are: a collection of sad, dysfunctional, bigots who both celebrate their social exclusion and plot the downfall of those who exclude them. History shows us they will never be able to unite under one banner, at least not for very long. But it would be a tragedy if a lack of historical context in the coverage of current events gives the wrong impression, helping Klansmen to achieve any form of unity." To many commentators, the Klan costume is now the perfect visual sleight with which to decry Trump’s cack-handed false equivalence. After all, hoods and burning crosses are the most potent icons of American white supremacy, an easy shorthand for racism and bigotry. 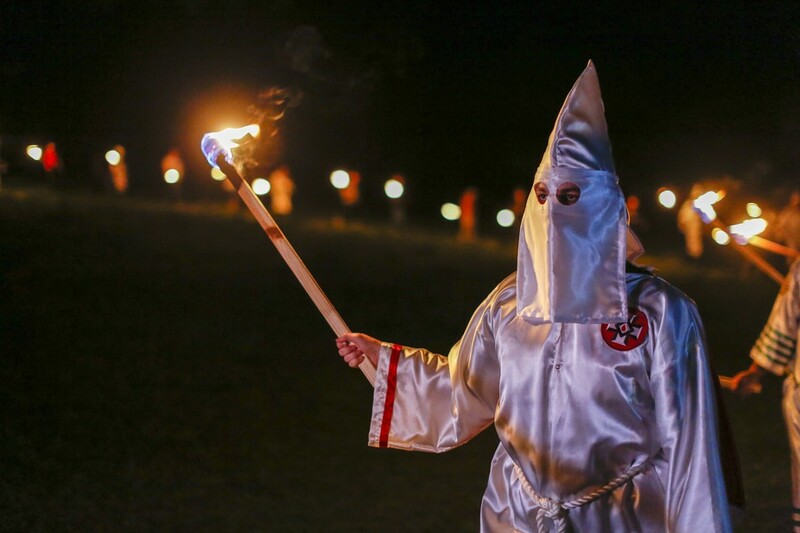 But despite the scenes of extrovert white supremacists on the march with burning torches in Charlottesville, something important has changed: today, there is essentially no such thing as “the Klan”. Its brand began to evaporate as long ago as 1944, when the Internal Revenue Service turned up an unpayable debt stemming from the organisation’s lucrative glory days in the 1920s. The debt was never repaid, meaning that those who would use the name today must settle it, which – thanks to compound interest – now stretches into the tens of millions. The upshot is that today there are many different, equally horrible organisations designed to spread hate, all using the word “Klan”, but unable to call themselves simply the Ku Klux Klan. The Southern Poverty Law Centre, which tracks hate groups across the US, currently counts 130 such groups. They total some 5,000 to 8,000 members. Few have more than regional appeal; very few have statewide reach, and none are national. Some groups share their anti-Semitic vitriol with neo-Nazi organisations, drawing on modern paganism, usually based around the neo-Norse mythologies. Some are militia-survivalists preparing for the Wagnerian denouement of US civilisation in a “race war”. Still others focus on what they call the “White Holocaust” of abortion, which they claim disproportionately targets Caucasian babies, or adhere to “traditional” white supremacy grounded in extreme white Anglo-Saxon protestant ideals. Frightening though this may sound, this is far from a return to the KKK’s 1920s heyday. Back then, it was a true mass movement, pyramid-selling membership to millions of people in every state in the US and some of Canada; it even harboured ambitions of establishing “Klaverns” worldwide. Nor are we seeing a return to the Klans’ ultra-violent backlashes against civil rights in the 1870s or 1950s, when they commanded considerable, if localised, support. The media should be careful about labelling far right groups or activists as “the Klan” just because they have associated views. This gives the oxygen of publicity to the ideological remnants of a group that hasn’t really existed for 70 years. This was a different matter when the Klan was in full force. In 1921, the New York World famously ran 21 anti-Klan front-page articles, exposing the group’s awful activities day after day with large-point headlines – “Ku Klux Made Jews and Negroes Target for Racial Hatreds”, “Bitter Anti-Catholic Propaganda Peddled by Officials of Klan”. These headlines spurred a full investigation by a House of Representatives committee, where the founder of the Klan, “Imperial Wizard” William Joseph Simmons, successfully defended the order against claims of corruption, violence and bigotry. In a widely reported and memorable phrase, he argued his Klan was as “innocent as the breath of an angel”. Thankfully, few if any believe such claptrap today. But that’s no reason for complacency. It should shock us that the Klans and their allies feel confident enough to take part in a public rally on the scale of Charlottesville, and that they feel others in the US might support them. Nevertheless, they almost certainly don’t have popular backing and there will not be a return to the dark days when the KKK enjoyed mass national membership, or regional sympathy. Today, as always in the past, the Klans’ grab-bag ideology of hatreds and grievances contains the seeds of its own destruction. Publicity has the power to show “Klansmen” for what they really are: a collection of sad, dysfunctional, bigots who both celebrate their social exclusion and plot the downfall of those who exclude them. History shows us they will never be able to unite under one banner, at least not for very long. But it would be a tragedy if a lack of historical context in the coverage of current events gives the wrong impression, helping Klansmen to achieve any form of unity.